2. 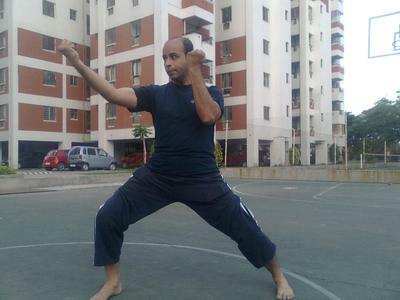 Frequent practice of Tameshiwari or breaking techniques. In kumite practice or in a real encounter, there is little scope for a combination technique. By kumite, I mean actual BUDO-KUMITE, specially the strong and tough JKA Style kumite. A single Kizami zuki or a mae geri or a Gyaku zuki decided the match and still does. The classic movies recently brought out, i.e. ‘High Kick Girl’ and ‘Kuro Obi’ ,both starring Tatsuya Naka Sensei, 6th Dan JKA, proves this point clearly. Old Traditional styles and JKA karateka who are reading this will surely agree with me. Senior Masters like Sensei Nakayama of Shotokan, Sensei Higaonna of Goju ryu, Sensei Mabuni of Shitoryu, Sensei Suzuki of Wadoryu all stressed upon acquiring an explosive technique, a sure dependable, devastating outburst of power capable of causing extensive damage on the target. So these great Masters insisted on simple basic techniques. They urged students to practice fundamental techniques more and more, until they became second nature and at the time of requirement, would explode out naturally on the target. Master Funakoshi often reminded students saying that, ‘If you solely put all your power, timing, strength and mental fortitude in a technique, there is almost no need for a second technique… if you need it, it shows your first technique was not committed enough’ I was fortunate enough to have trained under Sensei Mikio Yahara and Sensei Pemba Tamang formerly of JKA, both these renowned Senseis ingrained within us that karate is about Ippon-Waza, one serious strike or kick is the decider. In fact, Sensei Yahara later made this Maxim the motto of his organization KWF. The Shotokan school of karate stresses the acquisition of ‘mizu no kokoro’ – mind like water and simultaneous demonstration of power adequate to control armed attacks using a single decisive technique. The JKA, ISKF, WSKF, KWF, JKS, ITKF and other mainline organizations all propagate the development of ippon-waza, even though in competitions we are to score with combination techniques. The nature and grandeur of ippon waza is best appreciated in each kata- the technique requiring ‘kiai’ / terminal technique, is usually designed to destroy / maim/ crush strong attacks. It is to be noted that in Shotokan, there are many techniques in kata which require kiai but are defensive moves, like in Kata Heian 2, Jitte, Unsu, to name a few. This underlines the Karate-do maxim – the strong defence with kime-waza serves as an effective counterattack. This is ippon-waza. In today’s world of tournaments, championships etc. serious karate-do has taken a back seat. Many students and instructors are interested more in state and national camps, championships, certificates and gradings. Many people train today only for the belt, title and rank, for them the acquisition of self-control, power, strength of character and efforts are secondary. Training in Dojo-kun and Shotokan’s Niju kun is almost extinct now in dojos. To stop this negative influence, hard daily Makiwara training, development of focus, i.e. KIME, development of KIAI, aiming towards better Tameshiwari performance, and forging an uncompromising, relentless frame of mind i.e FUDOSHIN, a mind which is calm yet strong, relaxed yet alert, should now be our focus area. Karate-do is not about 8 rounds of bouts, this is only a competitive aspect of karate to make it more interesting, popular and attractive to young students. But karate-do has a much deeper implication. Karate-do was, is and should be a MARTIAL ART. A karateka should develop him/ herself into a weapon, powerhouse, an avalanche of strength and fortitude. This is the reason why Masters like Funakoshi, Nakayama, Enoeda, Kanazawa, Tanaka, Yamaguchi, Yahara, Suzuki, Mabuni, Kasuya, Osaka et al have said that competition and combination techniques are important in their own place but we must not forget the BUDO aspect of karate because karate is a martial art and not merely a sporting event. During training, all traditional masters, especially JKA Instructors under many of whom I personally trained, stress on ‘more in, more in’, i.e. the mental target should be beyond the physical tangible target. They teach us to have full commitment in our single technique. This is the essence of IPPON KARATE-DO. As Funakoshi Sensei said, ‘When you block, block like a mountain, when you attack, attack like fire’.